This is the third installment of MMI’s popular Distribution Leadership Forum – the only industry conference to focus solely on distribution in the investment advisory solutions space. The Forum brings together top wholesalers, sales managers, and their home-office partners for two days packed with information, frank conversations, and actionable takeaways. This highly interactive, one-of-a-kind program is designed to help distribution professionals raise their game and become more effective and productive at every level. To promote open discussion and an active exchange of ideas, space is limited. Sign up early to reserve your spot and take advantage of Early Registration pricing. 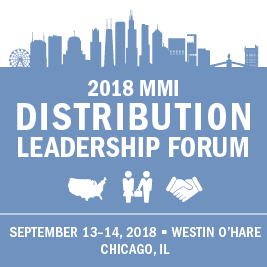 Note: Members of the MMI Center for Distribution Excellence are eligible for an additional $100 off the Forum registration fee. Contact MMI at (646) 868-8500 or events@mminst.org for more details. For questions on this event, please contact Arlen Oransky at aoransky@mminst.org or (646) 868-8505.
systematically identify – and maintain focus on – the most effective tasks to move those clients and prospects through the various stages of the sales process. To remain competitive in the asset and wealth management landscape, national sales organizations need to restructure their current organizational strategy around advisor coverage, territory design and management, sales roles and skills, and advisor engagement. The redefined, more modern sales organization will heavily leverage data and technology, focus greater attention on training and development, experiment with organizational structures, leverage enterprise resources, and update compensation plans to optimize the firm’s approach to the market. Lee Kowarski of DST Research, Analytics, and Consulting will share insights from DST’s thought leadership on the paradigm shifts that are occurring in sales distribution and what they mean for firms and their sales teams. A panel of top wholesalers will then weigh in on these trends – the opportunities and challenges they present, and what the sales organization of the future will look like. developing a weekly strategy using the Pillar System that allows managers to understand what is happening inside a wholesaler’s business beyond just recent sales and meeting counts. Collaborating with advisor consultants who represent distribution platforms and/or single distributors is an important leverage point for asset management investment specialists. There is no proven single approach, but those who excel at even the most fundamental forms of partnering will gain a competitive advantage. This expert panel will explore a wide range of best practices, including how to be relevant to each other, approaching advisors as a team, and delivering impactful joint meetings. Data and analytics have come into the financial services industry like a bull into a china shop, forcing us to rethink efficient product distribution from all angles. In this session, panelists representing three different roles within a distribution team discuss how these new tools are impacting everything from rotation construction and firm segmentation to initial advisor engagement, the structure of advisor meetings, ongoing service models, and internal partnering. What sales channel do you focus on? Join one of three discussion groups—Wirehouse, Regional/Independent and RIA or Dechannelized—for a deeper dive on important topics. You’ll have a chance to swap information and ideas with your peers from across the industry. As financial advisors evolve their practices to keep pace with changing client demands, what they expect from wholesaler relationships is evolving as well. This diverse FA panel will provide perspective on how they are future-proofing their practices, what is – and isn’t – effective in getting their attention, and what makes their “go-to” wholesalers stand out. The Forum represents a unique opportunity to build brand awareness with field distribution executives, showcase your firm's offerings, and make new connections. A limited number of premium sponsorship packages are available. Investments & Wealth Institute® has accepted the 2018 MMI Distribution Leadership Forum for 3.5 hours of CE credit towards the CIMA® and CPWA® certifications. Follow this link to reserve a room under the MMI room block or call the hotel directly at (847) 698-6000 and request the Money Management Institute rate. Reserve your room before September 5, 2018 to secure the discounted rate of $149/night (plus taxes and fees). After the cut-off date, room reservations and rates are subject to availability and prevailing rates. The Westin O’Hare is a AAA Four-Diamond hotel, centrally located approximately 2-1/2 miles from O'Hare International Airport (ORD), and is accessible via the hotel’s complimentary airport shuttle. Hotel amenities include complimentary high-speed internet service in the hotel lobby, spa services, an indoor heated pool and whirlpool, and a WestinWORKOUT® Fitness Studio. All cancellations are subject to a $50 cancellation fee. Full refunds minus the $50 cancellation fee will be granted for cancellation requests received prior to 5:00 PM ET on Wednesday, September 5, 2018. After that time, no refunds will be granted. Your registration can be transferred to another individual at your firm without penalty. To cancel or transfer your registration, please contact MMI at 646-868-8500.